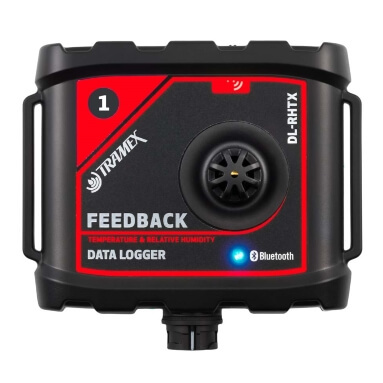 The Tramex Feedback DataLogger and App have been designed and developed by Tramex for professionals who depend on accurate, reliable readings using the very best, state of the art technology and performing to BS 8201, 8203, 5325 and ASTM F2170. 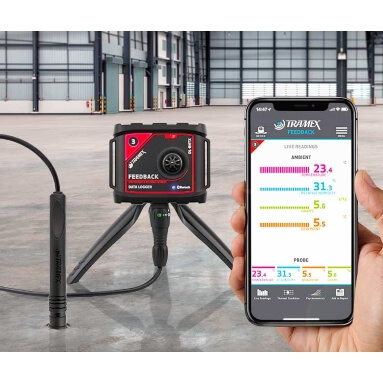 The Feedback DataLogger and App log up to 100,000 data point entries for relative humidity, temperature, dew point and grains per pound, transmitted wirelessly via Bluetooth BLE technology to your mobile device. On the App you can visualise Live Readings, Thermal Conditions and Psychrometric Charts as well as creating and exporting spreadsheets, charts and reports. 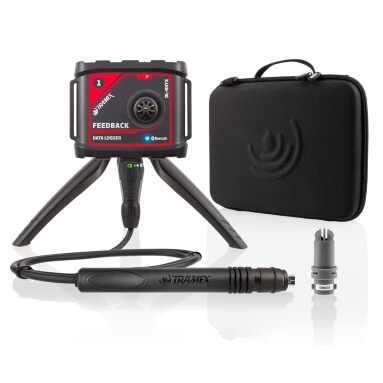 The Tramex Feedback DataLogger requires the Tramex Feedback Data Logger App and a compatible iOS or Android mobile device. Bluetooth BLE enabled for use with mobile devices. Up to 100,000 data point entries. Instant set up and start modes. Performs to BS 8201, 8203, 5325 and ASTM F2170. Ambient and in-situ RH and temperature logging. Intuitive and instructive App interface. Adjustable interactive chart, spreadsheet, report and easy-export functions. Connectivity up to 50 meters (165ft) for highly accessible data downloads. Includes FeedBack DataLogger, Hygro-i2 probe, DL-RHIE connector cable, tripod, hardshell case & quick guide. Ambient Relative Humidity, Temperature, Dew Point and Grains per pound. Contact Temperature, Estimated contact RH, Ambient Dew Point, Contact Delta Temperature (with Contact Temperature Probe - available separately - contact us). Psychrometric chart showing Relative Humidity, Specific Volume, Wet Bulb Temperature, Dry Bulb Temperature, Enthalpy, Humidity Ratio and Dew Point. With built-in Ambient RH & Temperature sensor, and included Plug-in RH & Temperature sensor. Providing the best available accuracy tolerances of 1.5%RH & 0.1ºC. Plug-in Contact Temperature Probe - available separately - contact us.